Connector: Microsoft xBox 360 AV Plug to Component Y/Pr/Pb, L-channel, R-channel (Male), Composite video. Specially designed to provide the sharpest video and sound for your Microsoft xBox 360 gaming system. Cord length: 6ft. Works with AV ready TV. Quantity: 1 Unit. If you are unsatisfied for ANY reason, just let us know. The manufacturer does not necessarily endorse use of these products. Best choice for yourself or your friend.You will not be disappointed! Red, White, Yellow standard AV on one end -- XBox 360 E connector on the other. Works on ALL XBOX 360 E consoles ONLY! Will NOT work on older XBOX 360. Designed to provide the sharpest video and sound for your Xbox 360 system. Xbox 360 Console. Composite cable for standard TV stand. 1 x High Definition Audio S Video Cable Cord. Connect to your HDMI or HDTV and enjoy the best graphics. SO U GET IT FAST! Next morning if after 5pm. It is in good used condition, cleaned, tested and works perfectly. This AV composite cable is for Microsoft Xbox 360 / Xbox 360 S Slim consoles (not compatible with Xbox 360 E). If you have an older TV with RCA Red, Yellow, White plugs you need this cable. It provides standard composite video & audio output for viewing on a TV / Monitor. Type: AV Cable. Platform: Microsoft Xbox 360. Model: Xbox 360 E. AV Connection: Composite/RCA. Cable Length: 6ft. Parts are sold as is see notes for details. UPC: 767578263915. MPN: ZZZ99076. Black and 3 feet long. Sold as is. There may be other imperfections I'm not aware of, although I've done my best to examine and report and photograph anything I've found. Genuine Microsoft Official XBox 360 Composite Video AV TV RCA Cable Cord . Condition is Used. Shipped with USPS First Class Package. Official Xbox 360 Composite Audio/Video AV Cable - In Excellent Condition . Condition is Used. Works. Please refer to the pictures for details. 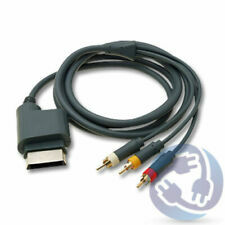 Details about the item: Very Good Condition OEM Official Microsoft Xbox 360 E Composite AV Cable RCA X864963-002. Platform: Microsoft Xbox 360. Item Type: Xbox 360. Type: AV Cable. Model: Xbox 360 E.
Item is used and may have signs of wear. Look at pictures for more details. Item has been fully tested, inspected and is in good working condition. Trending at $6.45eBay determines this price through a machine learned model of the product's sale prices within the last 90 days. XBOX 360 S Composite AV Cable. Features: 100% brand new and high quality Suitable for Xbox 360 slim console High quality and durable for long life use Long and flexible cable Easy to set up and use Color: as shown Note: Please allow 1-3cm (0.4-1.18") difference due to manual measurement and slight color variation for different display setting. Connector: Microsoft xBox 360 AV Plug-in Component Y / Pr / Pb, L-channel, R-channel (Male), Composite video. NOT compatible with: Microsoft Xbox, Xbox One. 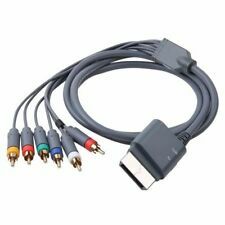 This component cable is specifically designed to provide the sharpest video and sound for your Microsoft xBox 360 gaming system. Official Microsoft Brand Xbox 360 Composite RCA AV Cable . Shipped with USPS First Class Package. ITEM HAS BEEN TESTED AND WORKS GOOD. No labor warranty is provided. This item is used and is in working condition. No cables, parts, power adapters, drivers, software, bolts or any other accessories included unless stated above. Parts may be interchangeable with more years and models. [Compatible with: Xbox 360. Designed to provide the sharpest video and sound for your Xbox 360 system. We always make an effort to keep it upto date. ]. Connect to your HDMI or EDTV and enjoy the best graphics. 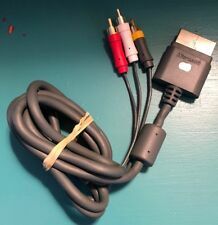 Microsoft Xbox 360 Audio Video Composite AV RCA Cable Cord,in excellent condition. Specifically designed to provide the sharpest video and sound for your Microsoft xBox 360 gaming system. Type HD TV Component Composite Audio Video Cable. 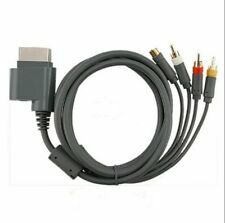 1 x HD TV Component Composite Audio Video Cable. OEM XBOX 360 COMPONENT COMPOSITE AV TV RCA CABLE CORD. Condition is New. Shipped with USPS First Class Package. Excellent condition xbox 360 standard composite A V cable gold plated. Genuine Official OEM Microsoft XBOX 360 Composite AV Cable x15-61979-01 NIB. Condition is New. Brand new in bag. Never opened, never used. Model Number: Xbox 360 S.
Genuine Official OEM Microsoft XBOX 360 Composite AV Cable Black BRAND NEW! Connect Xbox 360: Using Xbox 360 Composite AV Cable. Use the Xbox 360 Composite AV Cable with a standard-definition TV or monitor. This cable does not support high-definition displays. Experience the picture-perfect visuals with the AV cable for the Xbox 360. Official Xbox 360 Composite Audio/Video Cable. Condition is Used. Shipped with USPS First Class Package. LOT OF 25 Used Xbox 360 cords. All are in used shape and are the black and grey models. This bulk lot is sold AS IS! I have no way of testing these, but they look to be in decent usable shape. Buy them for parts, or test them and reuse them if they work!